My vote goes to Scooter's for its delicious frozen custard. Custard tastes better than ice cream and, in my view, Scooter's butterfat content is just about right (Kopp's to me is too over the top). Furthermore, it is truly a great neighborhood restaurant because the owners, Denny and Mardi Moore, are so friendly to everyone. Mardi knows my kids and even chided me for sneaking in there without them one day recently. One small example that is indicative of the atmosphere is that this season they put the free water dispenser down at a lower level and were so happy that this allowed the young kids to fetch their own water. They are also equipped with kid-necessary wet wipes for those messy ice cream faces. King's Thursday wrote: My vote goes to Scooter's for its delicious frozen custard. Custard tastes better than ice cream and, in my view, Scooter's butterfat content is just about right (Kopp's to me is too over the top). What a great nomination, I'd like to enthusiastically second Scooter's for an LTHForum GNR. One small note, while Scooters is great, I, being a proud Milwaukee native, disagree Kopp's is over the top. At the top, absolutely, over? This hasn't drawn any additional comment, though I doubt it's very controversial either, but since I just brought half of a Scooter's sundae home to the original poster, I suppose I ought to say something nice about it. Do one thing well. (Okay, plus hot dogs. I must admit I've never tried those, though I hear they're pretty good.) It's a good policy and Scooter's proves the wisdom of it. view there is little comparisoin between Kopp's and Scooter's. over it (but both are in Milwaukee, and presumably not eligible for GNR's). their product and have learned from the best. which is what led me to it in the first place). I remember Gramps. Is it under the same ownership? The people were hoping to move to Arizona, then develop Gramps as a franchise. a buyer yet - it could take an indeterminate amount of time, I suppose. On a side note when it comes to other cities' custards, anyone ever had Wild About Harry's in Dallas, TX? Now that's good custard, priced reasonably. I went to Scooter's last night, where my friends and I ordered three small chocolate cones for around $8. These small cones were double scoops at other establishments, which if you stick to those cones, the price was reasonable. We were there around 8:30 at night, we saw only one child and all the other clients were young adults. I am used to a higher kid ratio, which I attributed to the neighborhood's population. While I agree with c8w, Scooter's ice cream parlor is not in the league of quality and attention given to Gramps. Unfortunately this gem seems to be known almost only to c8w and I. People going through St. Charles really ought to visit and write the place up. We might have had the flavor of the day, something call Royal Cake Batter, if anyone could explain what that meant. We enjoyed our cones, though truthfully I like Kopp's better. Yet I can see its' appeal as a narrowly focussed specialized food vendor. If you like that, then you should try to all bubble tea joint up the street from Burt's (in the strip mall at Dempster) for another narrowly focussed food vendor. I was there last night around 7:30 and there were about 4 kids at the time. I think the reason there are few kids at 8:30 p.m. is that sugar that near bedtime will keep the youngsters wired until all hours of the morning. By contrast on warm summer nights in Highland Park, the ice cream store is loaded to the gills with families until closing time around 9 or 10 PM. We just got back from a pleasant visit to Scooter's. We had been once last summer. The Turtle Sundae was great! Fresh toasted, salted pecans. Plenty of Caramel and Fudge. My husband enjoyed the White Mint Chip on a fresh waffle cone. And how can you beat a place with free toddler cones?! (doggy cones too, bubt we left her at home) It looks tiny from the front, but there is a pleasant large space to sit in the back as well as chairs outside (too chilly tonight though). Scooter's is doing a good job and is a blessing to the neighborhood it is in. 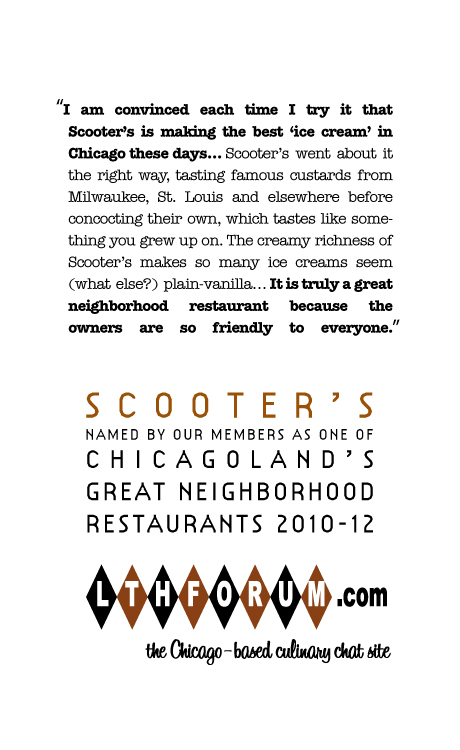 You know, it's funny, as I read through all the Scooter's praise on the board, my thought is, Couldn't people say this about any ice cream spot? I mean, people just like ice cream. But the thing is, they don't (say it about anyplace that is). Chocolate Shoppe gets some love on the board, and there is the massive cataloging of ice cream places post. Penguin gets a lot of love, but also some mixed reviews. Anna Held? Bobtail? Australian Homemade? People don't seem to be flocking to these places, or more to the point, mentioning them in passing as they do with Scooter's. Which isn't to say that GNR is a best in category award. Just that Scooter's seems to generate a lot of "I stopped here after dinner at ... and it was delicious" or "Scooter's is a great ice cream option", in contrast to the hyperbolic encomia bestowed on some places. And I find myself using it in much the same way. I don't rave about Scooter's. I like it a lot, but I don't crave it like, say, Graeter's. I won't necessarily miss it when I'm gone. But when I go out for ice cream, it's right near the top of my list. And that seems to be true for a lot of people here. And you can't argue the dedication and care of the owners. I'll admit to some hesitation, but this is a nomination I can heartily support. I regret that I did not make my personal view explicit. I do rave about Scooter's. I don't just like it a lot, I love it a lot. I crave it, I crave it every hour of every day. I will definitely miss it when I am gone. And when I go out for ice cream, it is right at the top of my list. My family and I can speak from entirely too much recent experience on that topic. Scooter's reopens March 7, which just gives you time before the renewal period if you want to go. I recommend a turtle sundae. So do Myles and Liam. I like the Chocolate Boston Shake which others believe is too much, but I heartily concur on this renomination (see comments supra). Scooter's is the place we head on a warm evening when we need to get out of the house after dinner. I love the brownie sundae - my daughter gets a chocolate cone. I wish we could walk there. Scooter's was packed on Friday night. If an ice cream place that can pack 'em in on a cold night in March isn't a neighborhood favorite, what is? P.S. Vanilla custard still delicious. Mike G wrote: Scooter's is open. Yeah, I was there for opening night on Friday, too. The vanilla custard was a little creamier, richer and denser than I remembered. I'm not sure if Scooter's has tinkered with its recipe or not, but to my taste buds at least, its product rivals the custard made by Milwaukee giants like Leon's and Kopps. And the service is always friendly and efficient. Kid friendly, dog friendly, high quality, worthy of political uprising. I had an extra-thick, extra-malty pistachio malt last week, complete with at least a half dozen delicious whole pistachios. That's about as good as ice cream/custard gets for me. This is destination ice cream! It's cold but I rose to the challenge. I consumed a small concrete yesterday. I hate being cold. I hate cold food when it's cold outside. I frequently use these feelings for not consuming salad during the winter (I'll admit that I leave my salad greens & tomatoes out during the winter months so that they aren't refrigerator cold) so you can understand how uncomfortable I was eating that concrete right? Scooter's GNR should be renewed. 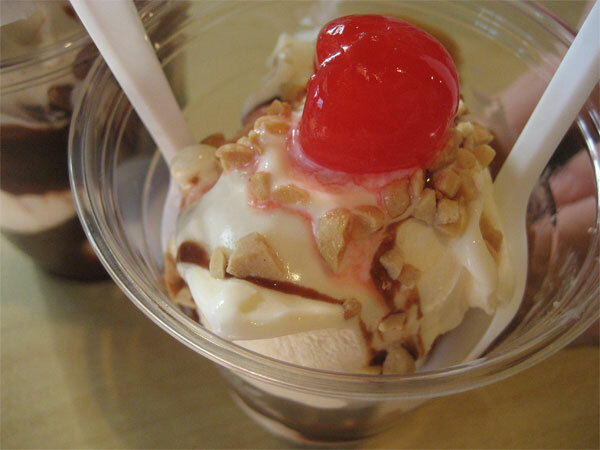 While I don't share the unbridled love for Scooter's, I am a Kopp's custard man, I recognize its place in the hearts of LTHers and support GNR renewal. My husband described my strawberry shake as "The best Strawberry Shake he's ever had". I have to agree. High quality and generous strawberry topping. Chunky, but able to get through the straw. It was beyond good. Free toddler cones, and good Turtle custard were also enjoyed, but that Strawberry Shake - seriously destination worthy.